Produced by the Association of 16mm Narrow Gauge Modellers with assistance from the Ffestiniog Railway, this is the latest in our series of “Modeller’s Guides”, edited by Andrew Charman and sent to our Association members in October 2015 as part of their annual membership benefits. 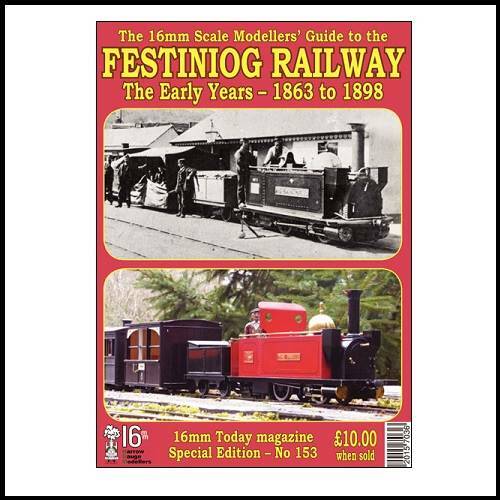 The inspiration for this guide was provided by three photographs of scenes on the Festiniog Railway in its earliest years (hence the single F of the title, unlike the Ffestiniog of today), and considering as a result how much of this iconic and hugely popular railway is available to model in 16mm scale. From this simple premise has developed this 84-page Guide. It is loosely divided into sections, beginning with the early history of the railway as a whole, then focusing on the locomotives – both the England 0-4-0Ts and the articulated Fairlies, passenger and freight rolling stock and the infrastructure, in particular the signalling. Each section begins by describing the prototype, with a fascinating selection of period images kindly provided by the FR Heritage Group. What is available in 16mm scale is documented, together with step-by-step guides to constructing kits and scratchbuilding items that are not available. Several drawings are included to help the modeller. Heritage has a major role in the Guide, in particular the various innovative methods modellers have used over the years to build Festiniog locomotives – from much-desired creations produced by pioneers such as Archangel, to clever conversions of low-budget Mamod locos. And at the other end of the scale, the construction of a brand-new double Fairlie built from Roundhouse power bogies is also featured. With extras extending down to such basics as milestones built in slate, this Guide should be of great interest both to those directly interested in recreating the Festiniog and the general narrow gauge modeller.